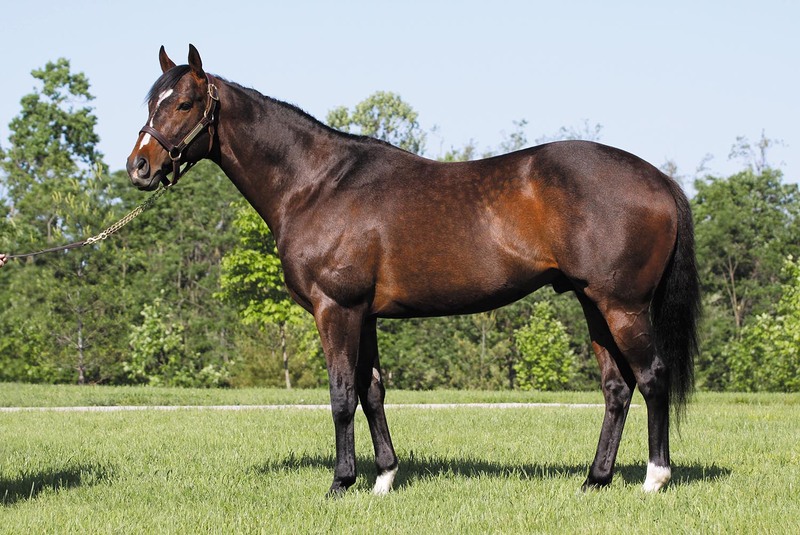 Many years ago, long before he became US Leading Sire, and long before his sons Kitten’s Joy and Medaglia d’Oro (USA) became six figure stud fee sires, we suggested to a major Australian stallion station that El Prado might be a good horse to shuttle. The farm was interested, but it turned out El Prado wasn’t available, and he never did come to Australia. Eventually, a good son of El Prado, Artie Schiller (USA), did make the trip, and judging by his results, El Prado might have been a very positive influence. Artie Schiller didn’t retire as a one of the best dirt performers of his generation, like Medaglia d’Oro, nor was he a Champion Turf Horse who retired with the committed support of his owners, like Kitten’s Joy. Nonetheless, he began his stud career as a very well credentialed prospect. A maiden winner and second in the Pilgrim Stakes-Gr.2 at two, Artie Schiller won five of eight races at three, including the Jamaica Handicap-Gr.2, National Racing Museum Hall of Fame Stakes-Gr.3 and Woodlawn Stakes. Successful in three of six starts at four, Artie Schiller took the Bernard Baruch Handicap-Gr.2, Maker’s Mark Mile Stakes-Gr.2, and most impressively defeating that year’s Champion Turf Horse Leroidesanimaux, to take the Breeders’ Cup Mile-Gr.1. Remaining in training at five, Artie Schiller failed to win in three starts, but nearly downed another Champion Turf Horse, falling a nose shy of Miesque’s Approval in the Maker’s Mark Mile Stakes-Gr.2. In addition to proving himself a top-class miler, Artie Schiller took to stud an excellent pedigree. Artie Schiller’s dam, Hidden Light (by Majestic Light), was an absolutely top-class runner who won half of her 12 starts, including the Santa Anita Oaks-Gr.1, Hollywood Oaks-Gr.1, Del Mar Oaks-Gr.2, and the La Habra Stakes. To the cover of Fusaichi Pegasus, Hidden Light produced Our Table Mountain, a South African stakes winners whose daughter Silver Mountain won the most recent renewal of the Cape Fillies Guineas-Gr.1. Hidden Light’s Red Ransom filly, Speed to Burn, took third in the Astarita Stakes-Gr.2, and is dam of the Boiling Springs Stakes-Gr.3 winner Munirah, who is by El Prado’s son, Kitten’s Joy. Hidden Dance, and unraced daughter of Nureyev and Hidden Light, is dam of the Japanese Graded scorer Toho Alan. Hidden Light is a sister to the San Juan Capistrano Invitational Handicap-Gr.1 hero, Prince True (USA), and she is out of the tremendously accomplished race mare Tallahto, a daughter of Nantallah, who took the scalps of colts in the Oak Tree Invitational-Gr.1 and Carleton F. Burke Handicap-Gr.2. Artie Schiller actually has Nantallah 6fx3f through Thong (third dam of Sadler’s Wells) and Tallahto. We can also note that El Prado is inbred to Turn-to, and that his dam is by a grandson of Turn-to out of a mare by a son of Menow. Majestic Light’s second dam, Champion High Voltage, is by Ambiorix (half-brother to the dam of Turn-to) out of a mare by Menow, so somewhat echoing that cross. He eventually goes back to Frizette via Vagrancy, the same branch as Elusive Quality. Retired to stand at Hurricane Hall, Lexington, Kentucky, Artie Schiller subsequently moved to WinStar Farm, Versailles, Kentucky, where he stands alongside shuttle star More Than Ready. Artie Schiller’s first northern hemisphere crop debuted in 2010, and contained five stakes winners. Despite standing for relatively modest fees, he has continued to be a consistent source of black-type winners and in the US he now has 19 stakes winners from his first six crops, headed by the Breeders’ Futurity-Gr.1 and Spiral Stakes-Gr.3 scorer We Miss Artie and My Conquestadory, who took the Alcibiades Stakes-Gr.1 and Summer Stakes-Gr.3. This pair of Gr.1-winning juveniles came along in the same Artie Schiller crop, his fourth and most prolific to date, with a total of six stakes scorers. Other Artie Schiller notables in the northern hemisphere include Mr Commons, successful in the Arcadia Stakes-Gr.2 and Sir Beaufort Stakes-Gr.2; the San Antonio Stakes-Gr.2 scorer Blingo; Big Bane Theory, who took the City of Hope Mile Stakes-Gr.2; and Anne’s Beauty, heroine of the Ontario Colleen Stakes-Gr.3. Artie Schiller arrived to cover in Australian for the 2007-08 breeding season has returned every year since, with the exception of 2010-11. So far he has 11 stakes winners, the best has been Laser Hawk, winner of the Rosehill Guineas-Gr.1 and Newcastle Newmarket Handicap-Gr.3, and also third in the Australian Derby-Gr.1, Randwick Guineas-Gr.1 and George Main Stakes-Gr.1. Eight of the Artie Schiller’s have won at Group level: I Love It, who captured the Bow Mistress Trophy-Gr.3, and was also Gr.1 placed; Vain Queen, whose principal success came in the G.H. Mumm Stakes, and was runner-up in the William Reid Stakes-Gr.1; Lady Melksham, who took the W. W. Cockram Stakes-Gr.3; the R. N. Irwin Stakes-Gr.3 scorer Daytona Grey; the Breeders’ Stakes-Gr.2 scorer Big Chill; and his most recent stars, Flying Artie, who followed up a debut second in the Maribyrnong Plate-Gr.3, with a victory in the colts and geldings division of the Blue Diamond Prelude-Gr.3 and was then runner-up to his stable mate Extreme Choice (Not a Single Doubt-Extremely by Hussonet) in the Blue Diamond and Good Standing, who broke his maiden with a win in the Skyline Stakes-Gr.2 on February 28. Artie Schiller already has six stakes winners out of Mr. Prospector line mares, with former shuttler Fusaichi Pegasus supplying the dam of Gr.1 winner We Miss Artie. Two of his stakes winners are out of mares by Machiavellian, who has been represented in Australia by Street Cry, Street Sense and Vettori. Another former shuttler, Unbridled’s Song, is broodmare sire of Australian Group winner Daytona Grey. We can also note stakes winners out of mares by Miswaki (sire of Umatilla), who is bred on the same cross as Woodman and Seeking the Gold, both of whom have been well-represented in Australia; Numerous, who gives inbreeding to the family of Sadler’s Wells, grandsire of Artie Schiller, and is a brother to Jade Robbery and Chequer, and closely related to Geiger Counter; and Carson City. The previously mentioned Elusive Quality would bring several interesting elements here. As far as the Northern Dancer line is concerned, Artie Schiller has Group winners I Love It and Big Chill from daughters of the Danzig line stallions Foxhound and Maroof. Artie Schiller has yet to have a stakes winner out of a Danehill line mare, but since he is a Northern Dancer/Majestic Light cross, and Majestic Light is something of a genetic relative to His Majesty, the broodmare sire of Danehill, one might expect it to eventually work in the same way that Danehill enjoyed success over the Northern Dancer/Majestic Light horse Catrail. Danzig through the Green Desert line will double Northern Dancer/Sir Ivor. Crossing Artie Schiller back over Northern Dancer through Sadler’s Wells’ relatives Nureyev and Fairy King has proved successful. From Nureyev line he has a stakes winner out of a mare by Theatrical, which suggests trying daughters of Stravinsky, or Spinning World and his son, Thorn Park (Spinning World brings in the oft successful Sadler’s Wells foil Riverman, and Thorn Park’s broodmare sire, Bluebird, is a Northern Dancer/Sir Ivor cross, like El Prado). We wouldn’t be surprised to see Zabeel, effectively a reverse cross to El Prado, work well at some point. Artie Schiller’s stakes winner Moving Money is out of a mare by Fairy King son, Second Empire, which invites trying Encosta de Lago (who has a Sir Ivor/Northern Dancer cross tucked away at the bottom of the pedigree). Inbreeding and line breeding to the Sadler’s Wells family (Special, Thong, Rough Shod II) is also indicated by the success of Graded scorers Mr Commons (whose dam is by Apalachee, a son of Thong’s Horse of the Year sister Moccasin) and Big Bane Theory (dam by Alysheba, whose broodmare sire Lt Stevens is a brother to Thong). Graded winner Anne’s Beauty came from a daughter of the Storm Bird horse Sea Wall, underlining the potential of Bluebird and sons. Artie Schiller also has stakes winner Secret Liaison from a daughter of the Northern Dancer horse Jugah, and stakes winner Sonny Inspired out of a mare by Silver Deputy (a son of Deputy Minister, whose Australian representative Dehere is a Northern Dancer/Secretariat cross, where El Prado is bred on a cross of Northern Dancer and Secretariat’s half-brother Sir Gaylord). The Northern Dancer-Secretariat cross also comes into play in the case of Good Standing, who is out of Elahi, a mare by Giant’s Causeway, a son of Storm Cat, while his second dam, the dual Gr.1 winner Tempest Morn, is by Kentucky Derby winner Thunder Gulch whose dam is by Storm Cat’s sire Storm Bird. The Seattle Slew line has done very well under Artie Schiller, with My Conquestadory out of a mare by Malibu Moon (A.P. Indy), Hop the Six from a daughter of Pulpit (another A.P. Indy horse) and Irish Art out of a mare by Seattle Song. Australian breeders have a top-class source of A.P. Indy in Bernardini, while another shuttler, Congrats, is bred on the same cross as Malibu Moon and Pulpit. Graded winners Vain Queen and Lady Melksham are out of mares by Kenvain and Keltrice, so other Kenmare strains such as Metal Storm might work. Graded scorer Blingo is out of a mare by Sure Blade (by Kris, from the Sharpen Up line); stakes winner Mezeray Miss from a Quest For Fame mare; and stakes winner Senator Beck out of a mare by Benny the Dip, who is by Roberto’s son, Silver Hawk, which might suggest trying mares by Red Ransom and his sons. Artie Schiller stands at Emirates Park Victoria where his 2015 fee was $13,200 inc.gst. He looks a real value option for Australian breeders in 2016!